JT – Formula 1 made its third stop of the season in Baku last weekend for the Azerbaijan Grand Prix, a street circuit event that has become a wild-card on the F1 calendar. The race didn’t disappoint, providing plenty of action and even some racing. Lewis Hamilton inherited victory after teammate Valterri Bottas ran over debris while leading the final laps. Sebastian Vettel had dominated at the front until stopping for new tires just after half-distance. Bottas stayed out on his original tires longer and led but was expected to drop to second when he finally pitted. However, a collision between Red Bull Racing teammates Daniel Ricciardo and Max Verstappen brought out the safety car with 12 laps to go. Bottas took advantage of the safety car and retained the lead even with his pit stop. With Vettel running second and Lewis Hamilton in third, the race looked to be between Bottas and Vettel. On the restart Vettel tried to dive under Bottas at Turn 1. But he locked up and barely made the corner. Hamilton and Kimi Raikkonen got by and Vettel ultimately fell to fourth, struggling with flat-spotted tires that allowed Force India’s Sergio Perez to pass him for what became the final podium spot. There was plenty more to talk about – from Force India’s Esteban Ocon clash with Raikkonen at the start to Fernando Alonso’ drive through the field in his heavily wounded McLaren. But the biggest talking point was the crash of teammates Verstappen and Ricciardo. Fans are already referring to Verstappen as “Vercraschen” and most observers are blaming the Dutch driver for yet another incident. So, take a breath and tell me your thoughts about Azerbaijan. SJ – Well, first I think it’s a great track. Every year since they started racing there we’ve seen plenty of action and unpredictable results. As I’ve said many times before, I think street circuits generally are the way to go. There’s more unpredictability than you have with the modern road courses with their big run-off areas and generally quite boring layouts. When you go off-line or completely miss a corner on a modern road course you can carry on without any real punishment whereas at a place like Baku, you get punished immediately if you make a mistake. We need more of that I feel, generally speaking most of the street circuits around the world, Monaco being the exception, produce exciting racing and unpredictable results. The atmosphere is great because you bring the race to the people rather than to a track miles away where people have to drive in order to get there. All the City tracks around the world have by far the best ambience, it doesn’t matter if it’s in F1, Indycar, Formula E or any other series. The long straight in Baku, especially with the DRS, really encourages drivers to have a go, as we saw there was plenty of action in the braking zone. Tire wear wasn’t much of a factor in this race and if the teams weren’t required to make a stop by the rules, many of the drivers would have probably just carried on without any stops. What’s interesting is that at this race and most other races recently is that everyone goes for it like it’s a Formula Ford race on the first lap. I assume they all go mad because they’re all aware that’s their best and sometimes maybe the only opportunity to overtake during the whole race. It’s extraordinary how many, what can we say…. more than opportunistic moves were made. People were banging wheels everywhere. You have to say, if these are supposedly the best drivers in the world and most of them are getting paid accordingly, it’s marginal at best. I mean a lot of guys just threw the race away almost before it started. There’s no excuse for putting the car in the barrier only a few laps into the race when you have a potential top-six car. Unforced errors at that level are hard to justify, I think. The track conditions were not easy for sure, but that is still not an excuse for throwing away a great result. I can understand if it happened with one of the rookie drivers but in some cases these are drivers with nearly a 100 GP’s under their belt. Not acceptable in my opinion. It’s interesting to note though that it’s almost the same in every series, where you have plenty of very fast drivers, they can all produce great lap-times and qualify well but there’s still only a handful that know how to race well, that have the race craft to win races and championships. Lewis was fortunate to win this time, but the way he drove is how you win Championships. He didn’t try to force it when he knew he had a bad day but instead let the race come to him. He could easily have tried a move down the inside just like Vettel did but he didn’t and even if hadn’t won the race which of course was lucky, but regardless I think he made the best of what was for him a bad weekend. If Hamilton was lucky, then poor Bottas was extremely unlucky, as was Vettel who dominated the race until the safety car came out with 12 laps to go. Talking about Ricciardo and Verstappen, frankly they could have easily crashed several times well before the accident if Ricciardo hadn’t given more than adequate room to Verstappen every time where close earlier in the race. It’s the same thing I mentioned in regard to Verstappen’s driving in China and Bahrain. He’s been getting away with his moves for the past three years. But now the tide has turned because every one of them is so marginal, so low-percentage. Eventually, the odds catch up with you and you can’t get away with what you’ve been getting away with forever. I think almost every driver has been through this at some stage in their career. You do the same aggressive thing one year and you get away with every move. If you look back at all of the moves Max has made it’s been extraordinary that he hasn’t been caught out before and instead it’s been whomever he was dicing with that ended up with a broken wing end-plate or got run off the track or whatever else might have happened but Max always seemed to come out on top. But then things turn around and every move you make goes the wrong way, although he’s not doing anything different, but the tiny margins he’s dealing with all the time are now not in his favor anymore. Part of the problem when you’re constantly cutting it that fine, with one extremely low percentage move after another, is that you’re leaving your own faith in the hands of the guy you’re racing against, and none of the guys at this level will accept to get bullied forever. And, so here we are, all the “genius” moves from the past years now suddenly look clumsy and poorly executed. At some stage I think the penny is going to have to drop for him. You’ll never ever win a championship driving like he does. He’s still young and I’m sure these past races have taught him that you don’t have to win every battle to win the war and he will no doubt win several more races and championships. But he’s got to realize that he cannot keep doing what he’s doing and hope to get away with it every time. In this case, the crash was 110 percent Verstappen’s fault in my opinion. Once you’ve made a move in defense you can’t move again, especially not if you’ve opened the door slightly, which is what he did by swerving to the right. At that point, Ricciardo is 100 percent committed to the move on the inside, before then you could see that he was going to either go late on the outside or dive on the inside depending on the line Max chose. Once the door is open and he’s hard on the brakes at the very last moment there’s nothing he can do at that point but continue in the trajectory the car is going. If there’s suddenly an obstacle in front of you, you’re going to hit it, it’s as simple as that. And of course, Verstappen knows that, or should know that. He’s pulled the same trick several times before on other drivers, and it’s always been the guy coming from behind who got the short end of the stick, this time both were out immediately. What I would do if was Christian Horner or Helmut Marko, instead of constantly protecting him, I would have him sit and watch every video replay of every incident or accident he’s had where he got away with it and make him see how lucky he’s been in the past. Now circumstances have changed a half-percent in the wrong direction and he’s not just costing someone else a front wing or a lost race, he’s costing himself and the team DNF’s and extremely valuable points and not getting away with what he was before. Sooner or later you will run out of luck. JT – As a matter fact, Verstappen’s two moves in the braking zone are a violation of the FIA’s rules. And yet, the FIA stewards did not penalize him, only reprimanding Verstappen and Ricciardo, apportioning blame to both. Apparently, you’re correct. The FIA will not enforce its own rules. On the RBR team side, it seems they wanted the drivers to share blame so that Verstappen would not rack up any more points on his Superlicense. The FIA is weak in enforcing the rules. This has been a problem for a long time now and continues to be a problem. When they issue penalties they often issue them for the wrong reasons. But when it really matters and could make people understand that “this is where we draw the line”, nothing happens. I don’t believe in the system of having a different ex driver at every race. It needs to be a consistent and well respected small group of people that are objective and firm in their decisions so the drivers always know where the line is drawn. It’s far to random the way it is now. It’s the same on the technical side. They write a new set of rules and then three years later you have cars which have aero appendages that were never part of the spirit of the agreement. Everyone knows this but when every team has, literally, armies of people scouring the rule book to find any loopholes and the FIA doesn’t enforce it strongly enough or soon enough, it eventually gets out of hand and then we get what we have now. JT – One of the downsides of the race at Baku is the track organization. There were several instances where track workers looked overwhelmed trying to clear the track of cars or debris. Ultimately, the FIA’s laxness – there was a large tree branch on track for several laps, for example – cost Bottas the win. SJ – I agree, to me it’s a mystery that Formula 1, this super-sophisticated, highest-level racing series in the world, does not have a dedicated team of track marshals that travel to all the venues. How much would it cost to do what IndyCar has done for decades where you have a well trained crew and a pick-up truck with a small jet engine on the back which they use every time there’s a safety car to make sure the track is clean and free of debris? How much would it cost to ship that to every event? In particular with modern F1 cars, it’s literally like an explosion when they hit each other. There’s carbon debris everywhere and that stuff is like a needle, the threads of that carbon-fiber. Bottas was the first one to arrive where the collision had occurred and he was screwed. You’re traveling so fast by that point that even if you see something - by that time you’ve already hit it. If there’s any piece of debris left on the track there’s no way you can avoid it. It’s now 24 years since Senna had his accident in Imola… It’s a theory but I am convinced that he ran over the debris from the start line accident (J.J. Lehto stalled his Benetton on the grid and was hit by Pedro Lamy’s Lotus). There were shreds of carbon-fiber everywhere. It was the same thing as it was this time, some marshals picking up the debris by hand. I think he got a slow puncture which caused him to bottom out when he went through Tamburello and that’s what caused him to go off the track and into the wall. I don’t think anything broke on the car. This is just my theory but that’s very much what it looked like to me. The point I’m trying to make is, nothing has changed in 24 years. To see a bunch of marshals running around like headless chickens at Baku, picking up debris by hand does not look good. JT – Sebastian Vettel admitted that his attempt to pass Valterri Bottas on the late race restart wound up costing him but said it was a move he had to try. That seems a fair assessment. What do you think? SJ – I think he knew that was his only option and in a way I admire it. I know as a driver, if you didn’t have a go, you would lie there all night replaying the video in your head wondering why you didn’t try. Any driver worth his salt knows that if a win is possible, you have to go for it. His case was different from Lewis as he knew he had a winning car rather than just soldiering on trying to make the best out of a bad situation. The thing is though, the tires are so marginal these days. It’s the same point I made after the race in China. I don’t think any driver really knows where the limit is on the tires at any given point, especially not on a restart or leaving the pits. They’re hard to warm up, the pressures come up differently and there’s so many factors that come into play. You can see it throughout the races, even the cars from the same team act differently, if for whatever reason one of the cars get the tires lit up, they run super competitively for that stint and then for whatever reason the next stint the tires does not work they’re nowhere. I’ve mentioned this before and I’ll say it again, it’s ironic that teams are spending hundreds of millions of dollars on sophisticated aero, simulations, CFD and on and on. Yet on the day it just comes down to who can get their tires to work, after all that money has been spent, it literally comes down to a pound of tire pressure or 10 degrees of tire temperature on a set of tires that probably cost less than $5000 for a set. It seems like one car can make its tires work and the other can’t. Suddenly the Toro Rosso with Honda Power can hang with the top cars. This has nothing to do with either the car or the driver, but is purely down to how well the tires are working on the day. The car doesn’t suddenly improve by seconds, nor do the drivers, it’s purely down to the tires. JT – One of the elements that makes Azerbaijan a wild card race is attrition. There were teams, from Force India and McLaren to Sauber and Torro Rosso which might not have expected a good result. But with some retirements and good driving, they were rewarded. SJ – Yeah if you look at the results some of the drivers definitely benefitted. In Alonso’s case, yes that helped but don’t forget he is arguably still the best racer out there. What he does with the equipment handed to him is pretty miraculous. He has the ability to really maximize every situation. When he was with Ferrari, he carried the car on his shoulders and nearly won the championship with a car that was not really a championship winning car at the time. JT – I think seeing Toro Rosso, Force India and Sauber score points is satisfying to fans because of the frustration they feel with the fact that the majority of the F1 grid never seems to make much progress. People ask, why can’t they get it together and compete for wins? SJ – They can’t get any closer for a simple reason – the cubic dollars it takes to be at the top. The more you spend, the faster you go. It’s nothing to do with innovation or cleverness anymore, it’s just having an army of people grinding away at spending money on wind tunnels and simulations, and honing and tweaking tiny percentages on the cars. That’s the only way to gain performance, because the rules prevent any radical thinking and everyone is stuck fine tuning what you’re allowed to do within this very narrow box. The only team that have been consistently punching above it’s weight year after year is Force India, which they showed again in Baku, getting a podium finish with a car that was definitely not a top three car. It makes you smile when you hear the constant argument that spec parts becoming parts of the cars will cause F1 to lose its DNA or creativity. There’s been no creativity in F1 for over 20 years now, except innovative developments in the areas where the rules allow it to be, but as far as any new concepts nothing has changed. In comparison, this is where IndyCar has the technical side so right. And because of that, every team has a chance to get it right on race day and actually win. If you have a top driver, some clever engineers in theory any of the teams could win. There’s not much you can do to the cars in IndyCar but ironically, it’s very much the same in F1. The big difference is that every team in F1 has to be responsible for making everything on the car on their own. But there’s so little that you can do to the cars by the rules in F1, in terms of any new concepts, that it’s become like a spec series in many ways in as much as all the cars eventually end up looking the same as the rules don’t allow the teams to go a different route even if they wanted to. The engine rules are the same for everyone in that there’s only one concept of engine and every manufacturer have to fine tune and hone every aspect of that one concept in order to get an edge on the competition. JT – The F1 rules for 2021 continue to be hotly debated. Recently, the F1 Strategy Group and the F1 Commission agreed to increase the race fuel allowance from 105kg to 110kg in 2019, in order to help drivers “be able to use the engine at full power at all times”. It’s part of F1’s effort to increase overtaking and apparently the teams are also helping with “extra CFD research”. It seems ludicrous that F1 would need to conduct CFD research to understand how it might increase overtaking. A common sense reduction in downforce would surely help and be a simple low cost solution. As a first initiative, this past week a new aerodynamic rules tweak for 2019 has been implemented which is meant to help cars following each other and improve the overtaking situation. Is this another knee jerk reaction and if so, do you feel this is a move in the right direction? SJ – Yes, I agree it is very much a knee jerk reaction after only a couple of races into the new season. You can see recent illustrations of that if you look at F1 going to this higher downforce formula last year to make the cars go faster because it was decided they weren’t quick enough at the time. In part, it was a reaction to the fact that the GP2 or F2 cars’ lap times were getting too close to F1. So what happened? Collectively they spent probably $100 million per team across the board – if you figure it’s $300 million for the top teams to maybe $30 million for the back of the grid - to develop cars for the new rules with more downforce. So in total it cost the entire F1 paddock close to a billion dollars for this new car to make it go about 5 seconds per lap quicker just so they have a faster lap time than a GP2 car, or to get closer to the lap times they did some years before the Hybrid Formula started. Consider instead, if you had put a smaller front and rear wing on a GP2 car that probably would have cost less than $50,000 per car which would slow them down by 3-4 seconds per lap. So basically you’re talking a billion dollars to make the F1 cars go faster for that purpose or a couple million at most to slow down the entire grid of GP2 cars. And in the end, who cares, the difference is completely irrelevant on track. It’s complete and utter madness. Yet no one seems to want to budge, no one’s backing off. The part I don’t understand is if the money flowing into F1 stays the same as it is now - and there’s no reason why it can’t be - but everyone spend a third of what they’re spending now surely the other two thirds would be profit. That would have to be good thing in my mind, and the valuation of every team would go up accordingly and actually make the teams worth something again. JT – IndyCar returned Barber Motorsports Park for what was unfortunately, a rain-delayed race. Josef Newgarden pitted from the lead early for wet tires and that proved to be the right move. He eventually regained the top spot when late stoppers like Sebastian Bourdais and Scott Dixon couldn’t survive anymore on slicks in increasingly wet conditions. SJ – Yes, Scott was on the right strategy and had it not started raining more heavily, both he and Bourdais would have been looking pretty good for the win. JT - A week before Barber, IndyCar ran the Long Beach Grand Prix for the 35th consecutive time. Alexander Rossi dominated for Andretti Autosport, winning from pole position. As usual the crowds were large, proving that the event remains a highlight on the IndyCar calendar. 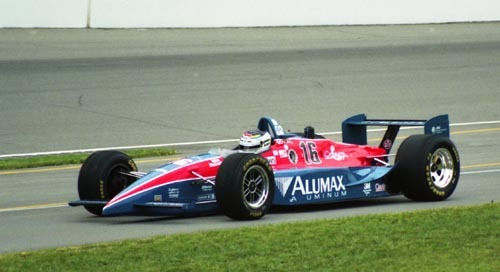 The race wasn’t as positive for Scott Dixon who finished 11th after starting from 4th. Scott ran 3RD and 2nd for much of the race until past halfway when a car hit the wall in turn 10. Dixon and Sebastian Bourdais immediately ducked into the pits but according to IndyCar they entered pit road just as the yellow flag flew. Bourdais was told to drive through the pits and continue around. But Scott was called in and stopped for service. That broke the rules and he was issued a drive-through penalty. What did you think of the race and Rossi’s dominant performance? SJ – Long Beach is always terrific. There was a great vibe in the paddock. It’s really become the number two race of the season next to Indianapolis. So many people come out for the race and the crowds are great. The new cars are racing well and everything I hear in the paddock is very positive about them, from their looks to the sounds they make. Everything is going in the right direction in that area I feel. Rossi has obviously done a phenomenal job so far this year. He’s got things dialed in very well right now. It’s interesting, with the new car some people seem to have found the magic bullet and others are struggling a bit more than what we’re used to seeing. The pit stop for Scott was obviously a disaster. The sequence of events did make it difficult though. You had one second to make a decision basically with a lot of factors to consider. It was extremely unlucky both for Scott and Bourdais. The yellow came out literally as they were turning to enter the pits. They really had no choice because they were both on fumes at that point. Scott couldn’t have done another lap if he’d wanted to. Bourdais went through and had to come right back for tires but they pulled Scott in and put tires on. So he got a penalty. It just didn’t work out. If the pit stop had gone as planned I think he had 2nd place locked up. JT – You’re part of the history at Long Beach. Your first race there was in 1993. You qualified 5th and started alongside Mario Andretti who was 6th. The field was 28 cars! That must have been amazing. What’s your memory of your first Long Beach GP? SJ – I loved the track from the first time I drove it. I’ve always liked street circuits but particularly these kinds of circuits (including Monaco) where there’s a lot of precision and you need to find just the right spot where the grip is, which is not always on the correct racing line. Once you find the right rhythm and the right places to be fast you pick up so much time. It’s a really fun track to drive and race on. Yes, there were almost 30 cars out there. But at that time a lot of the IndyCar races were like that. It was great. Unfortunately Mario and I collided before we even got to the start line. I was so bummed too because we tried a really wild thing in the morning warm-up. It was something we used to do when we raced at Hockenheim before they had the chicanes in F1. We’d take the Gurney flap on the rear wing and reverse it so that you put it behind the main flap on the rear wing. It gave the car just a little more lift on the rear which didn’t affect the low speed grip that much but made it a lot faster down the long straight. We didn’t lose much grip in the corners but the car was like 7 MPH quicker than anything else on the straights. I thought, ‘I’m gonna win this race!’ There was no question about it and what happened? I didn’t even get to the start line! SJ – Finally, let’s talk about racing etiquette a bit. For fans, it’s fun to wonder about some of the fine and not-so-fine points of racing on and off-track. Few people race professionally and fewer still do it at the top level like you did. How do you handle a situation in which your car, through no fault of your own, experiences a mechanical/electrical/software failure during a race and cannot continue? What’s the etiquette for the driver? Do you throw your hands up in the air, pack up and bolt away from the track as quick as possible without a word to anyone? Do you stay and commiserate with the team/owner for a while? 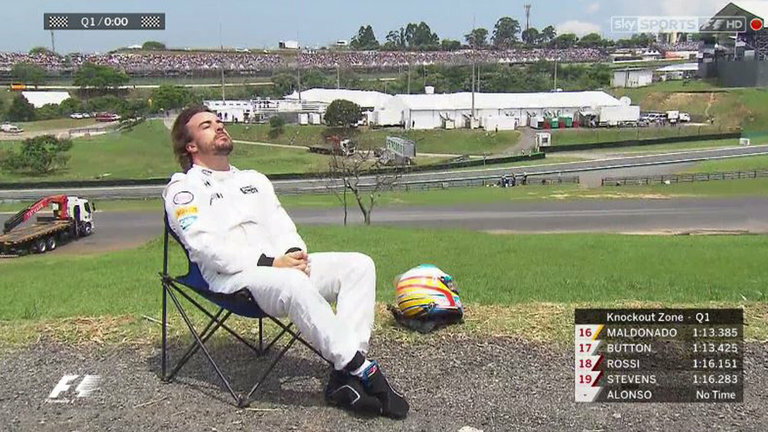 Or do you find a convenient lawn chair and get a sun tan trackside like Fernando Alonso during the 2015 Brazilian GP? SJ – Usually you just want to get out of there as soon as you can and get home. That’s what you normally try to do. But I always made sure I thanked every person in the team individually before I left the track. It depends on the schedule of the race and other things but I remember when I drove for Ligier in F1, for example. The car was such a dog that you never knew what weekend would be like. I used to have three different flights booked at every race. One was on Saturday evening in case we didn’t qualify for the race, another was on Sunday afternoon if the car broke down early in the race and then one on Monday morning if we managed to finish the race! Of course everybody on a team is bummed and pissed off if something like that happens and I think everyone just feels the same way – you just want to get the hell out of there. Then you regroup on Monday or Tuesday afterwards and you go through everything and analyze what went wrong and try to make sure it doesn’t happen again. JT - To make this extra fun, let me ask a related question. Let’s say you’re co-driving a sports car, maybe a prototype at Le Mans, and a co-driver wrecks the car in the Porsche curves – just wipes it out. What’s the etiquette for the driver/s who were not driving in that situation? Do you commiserate with the co-driver then leave? Do you want to strangle him and then leave? SJ – Ha! No… absolutely you commiserate generally, although it depends a bit on the circumstances. I’ve had some teammates who you just want to strangle of course but at the time you give them the benefit of the doubt at least. Every driver on the grid is a different individual, a different personality. Some guys are just great and we’re all trying hard and accidents happen from time to time. Less often you have a teammate who’s arrogant and blames everything and everyone around them, and it’s never their fault. So there’s no fixed code for that. But I’ve certainly had occasions where I’ve felt like strangling my co-driver and I’m sure there’s been times where they felt the same about me! But in the end, I’ve been lucky to have been teamed with not only some of the greatest drivers in the world but also some really good human beings in general. The camaraderie when you share a car at Le Mans for example is something really special and those moments is something I will treasure for all my life.